In the early days of the society, land had been bought down the side of a limestone ridge known as the Lincoln Edge. 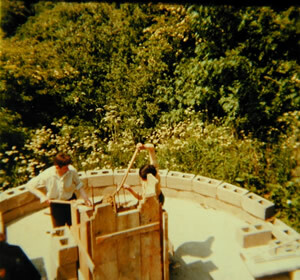 The plan had always been to build an observatory for an 18 inch reflector, but after completion of the lecture hall in 1964, insufficient funds delayed the start. Instead, an observing platform with a permanently based equatorial mount was constructed to use the society's 8.5 inch Newtonian reflector. 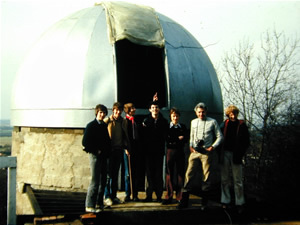 Eventually in the early 1970's the observatory was started. The land was cleared of the many bushes and the task begun. To secure the existing observing platform, a 10 feet high retaining wall had to be built first. This was done under the guidance of the then building director Arthur Thaiss. 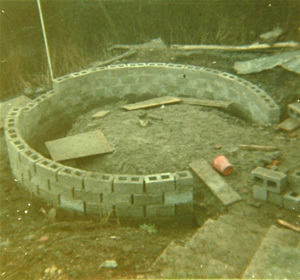 Made of breeze blocks with reinforcing rods, the work took over a year, but once completed, the observatory foundations could be dug. 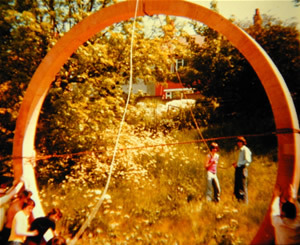 The design called for an 18 feet diameter circular wall with foundations 12 inches deep. Unfortunately the subsurface turned out to be clay and a 48 inch deep trench had to be dug. 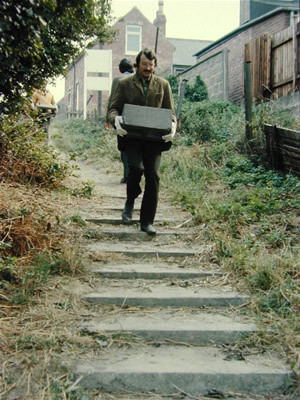 Access to the society is via a footpath from Westcliffe Street and all materials have to be carried or wheelbarrowed down this footpath and onto the society's land. Over 10 cubic yards of ready mixed concrete were required for the foundations alone. 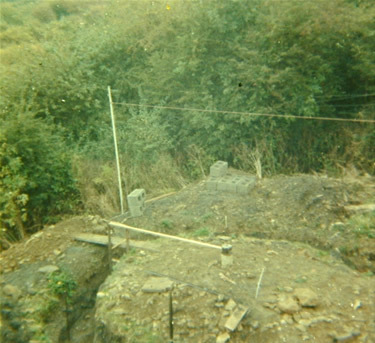 After the foundations had set the base of the observatory wall was started building up to where the concrete floor was to be laid. Another hole was dug into the clay to start the base of the telescope pillar. This is kept completely separate from the rest of the observatory to remove any vibrations. Once the pillar was above the lower room floor level, the floor could be laid. This was done in several segments and called for concrete to be mixed on site. 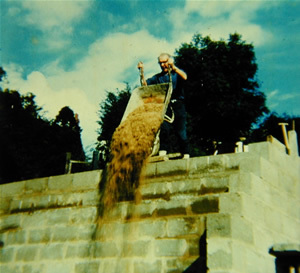 A cement mixer was acquired cheaply enabling work to continue weekly. 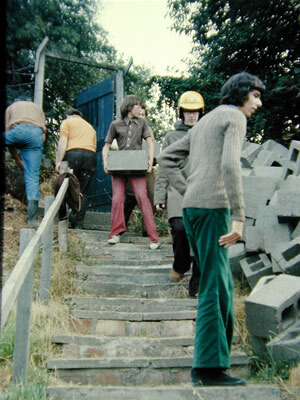 Now only sand, gravel, rubble and breeze blocks had to be transported down the hillside. Usual deliveries were 3 tons of sand or gravel, or several hundred breeze blocks, to be moved within a day. This called for a major coordinated effort from most members. With the concrete floor set, work began raising the telescope mounting pillar to the observing floor. This was built in sections reinforced with steel rods. The shuttering was raised week by week until the required height was reached. As the outer wall continued upward, work began on the inner wall which would eventually support the centre of the observing floor. The gap between the telescope column and this. With the tops of both walls now over ten feet above the observatory floor, lintels were made for a walkway above the lower entrance hall. 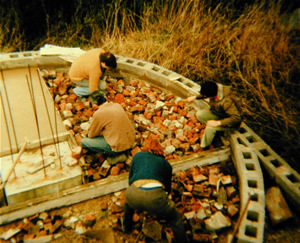 Once in position, shuttering was made to enable a reinforced entrance platform to be concreted. 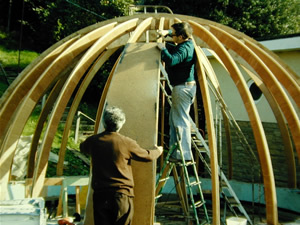 The frame of the observatory dome is made from 8 by 4 feet sheets of half inch plywood. These were cut in the lecture hall into segments approximately 4 feet long with a radius on both the outer and inner edges. A box section was constructed which would be the running surface for the dome wheels. This included a lip so that in high winds, the dome would lift and lock, rather than blow off. This was built upside down for convenience and then turned over. 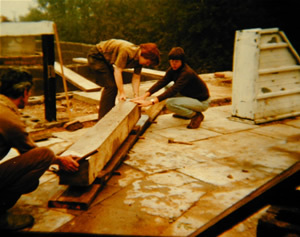 Rib sections, also made from plywood were cut to form the main dome structure. By now the dome had to be left outside and covered between weekends with plastic sheeting. The outer surface is hardboard, cut into segments to fit the round structure. These were nailed to the ribs. 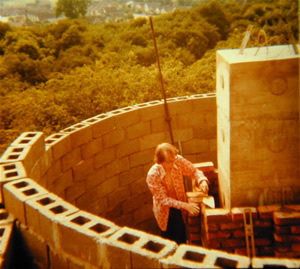 The designer of the dome, Peter Blunden, is seen at the end of fitting all the segments. The dome was sealed with mastic tape and painted with aluminium paint. The whole structure weighs over a ton and was man handled from the observing platform, over the entrance platform and onto the observatory wall. The structure runs on three wheelbarrow wheels and can be turned by one person. The shutter is made of hardboard and as with the dome is painted with aluminium paint. A pulley system inside allows the shutter to open by pulling a rope. The dome can be turned using a handle attached to the internal wall. 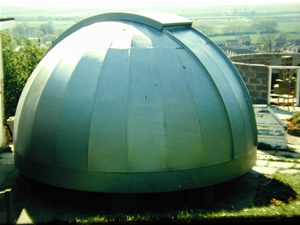 The observatory can be used by one person. 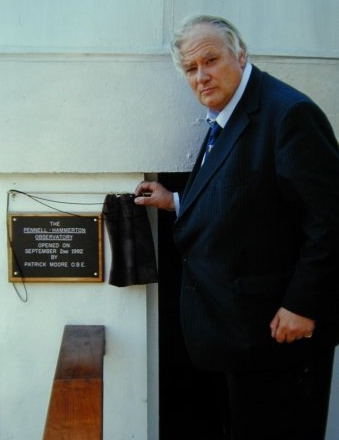 On 2nd September 1982 Patrick Moore opened the observatory. 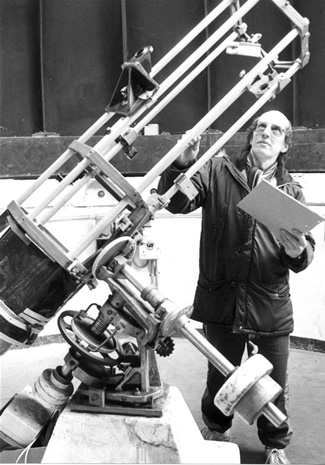 The Pennell-Hammerton observatory is named after the late Walter Pennell, who died before its completion and one of the founding members of the society, Peter Hammerton, who died 10 years after its opening. The observatory can be seen traveling north on the dual carriageway section of the A46 Lincoln bypass against the dark hillside. The telescope is a 12inch F6 Newtonian, on loan from the Pennell family. It is equatorially mounted with slow motion drives for photographic work and is attached to the top of the 18 feet high pillar. The observing floor is in wooden sections and like the rest of the observatory, is completely separate from the telescope pillar. 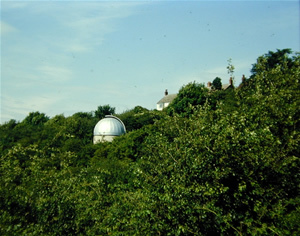 The observatory was originally designed in the 1960's, constructed during the 1970's, and refurbished in 2006/7. Society members use the telescope mainly on Tuesday nights and at the weekend. Key holders have access to the observatory seven days a week. The general public can use the telescope on open nights or as invited groups via the visits organiser when a slide show is followed by an observing session, weather dependent. This page is still under construction but will be available soon.